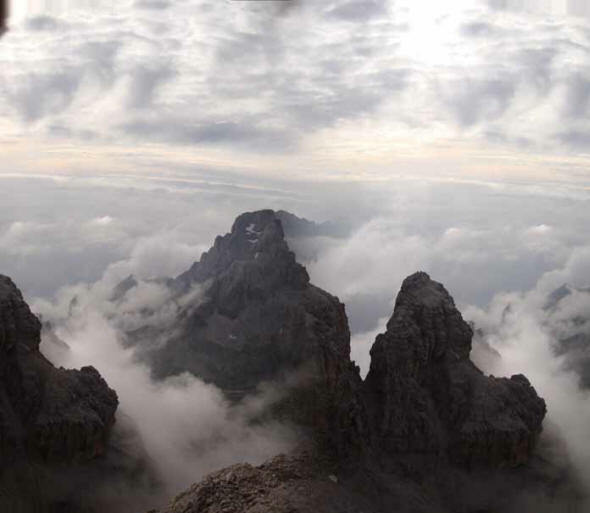 The Brenta group is the most westerly of the Dolomites and forms a lofty broken ridge stretching a distance of 12 miles. The chain of peaks is separated by a wide gap at its centre where the Groste Pass gives easy access from one side to the other. This is where the expedition started. To the south of the Pass the terrain is much shattered, decked with numerous bold rock towers and spires, splendid cliffs and all enclosed by small glaciers on the western side. It is through this amazing territory that our route was planned along a series of protected paths or via ferratas that go under the name of the Bochette Way. 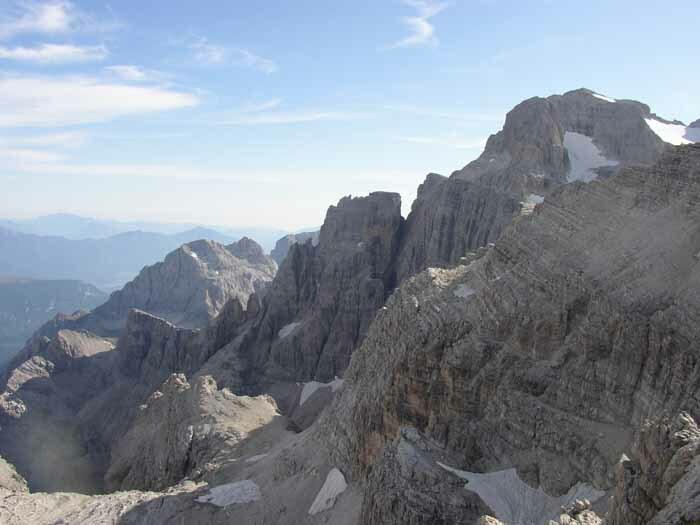 Scenically the Brenta is undoubtedly one of the mightiest mountain areas in Europe and the capacity to link a series of via ferratas in a hut to hut traverse of a mountain range is unique in the world. 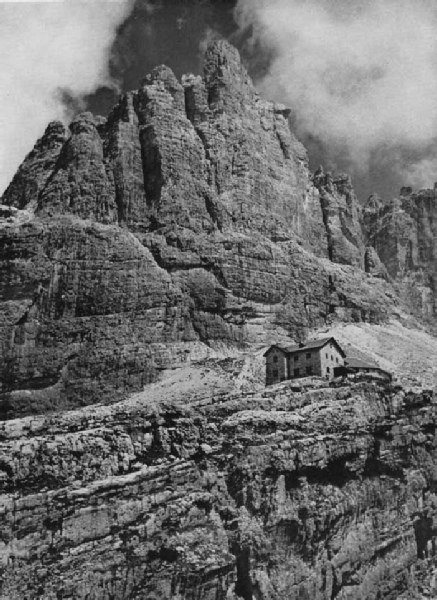 Climbing the Brenta started in the 1860's and by 1899 the final major peak, the incredible spire of Campanile Basso was conquered. From the 1930's people began to widen where necessary the horizontal rock ledges hewn out of the cliffs by wind and weather and equip them with pegs, ladders and wire ropes as a protected high level route. 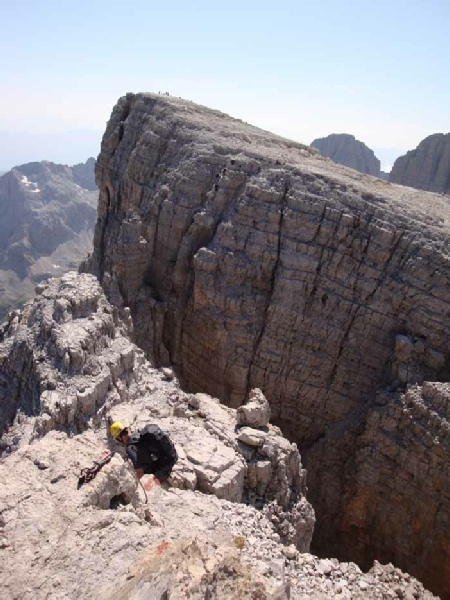 Over time the particular installations and connections became more and more exciting and now the Brenta is one the most popular areas in the whole of the Alps, climbers being drawn under the irresistible magic spell of the Bochette Way. Even though the route was not technically difficult, the Brenta can always and dramatically show the mountaineer the superior power of the mountains - a sudden drop of temperature, snowfall even in high summer, autumn icing, thunderstorms and the much feared Brenta mist. All can present very serious problems as the terrain never allows for a pathless descent. 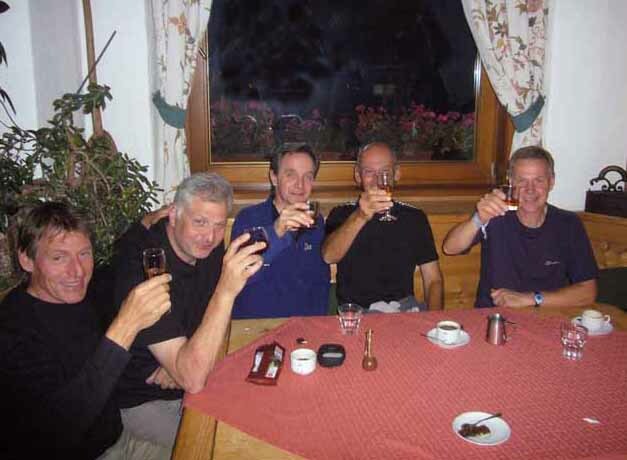 Trip members were two Marks, Martin, Bruce, Peter and David. Further photographs are available here. 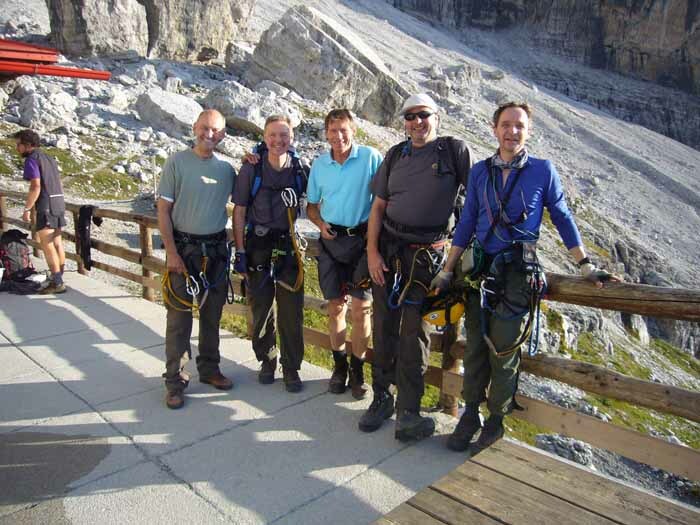 A DVD of the expedition is available to help those planning to go to the Brenta. The expedition started in fine weather with the ride up the Groste gondala from Campo Carlo Magno to the top station at Passo del Groste. The via ferrata gear and and helmets were donned for the first time and after a strenuous detour to the top of the peak overlooking the pass (our only peak of the trip), path 305 was followed until the first ferrata sign. The path picked its way through typical limestone desert to the first set of wire protection. A painted sign for the Tuckett hut confirmed we were on the right track as we wound our way along ledges and round corners with wires protecting the most exposed sections. The route descended to Vedretta di Vallesinella Superior and then a series of easy angled snow slope crossings lead to a sign pointed down to the right for the Sentiero B. Delle Giacomo and the Rif. Tuckett. Another hour of descent saw us down at the hut and checking in the for the night. After a good nights rest the day dawned clear, promising another perfect day. Sun screen was plastered on and then our steps were retraced upwards on the Sentiero Delle Giacomo. We had decided this would be easier than climbing the Tuckett glacier and this also meant we completed the last section of the S. Alfredo Benini from the previous day. This last section turned out to be the most entertaining of the Benini route involving a series of ladders and a climb on stemples that lead to the Bocca del Tuckett. During our break for the second breakfast of the day we met up with a pair of British climbers coming the opposite direction. Useful local knowledge was gleaned about the coming route including the fact that the final section of the S. Bochette Alta was closed due to repair work. 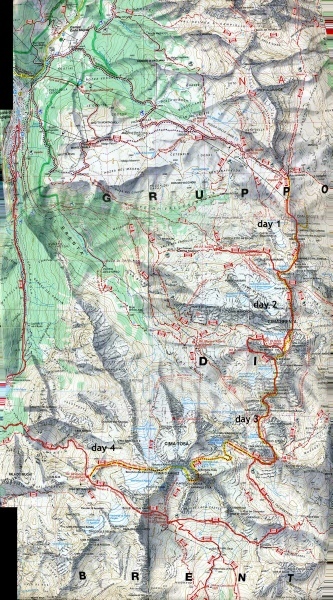 This helped out route decision making enormously and we decided to descent from the Bochette Alta by the way of the Sentiero Oliva Detassis to avoid this section. The first section of the route consisted of an ascent involving a series of cables, broken ground and ladders. The finish of the ascent was marked by the start of the Gabari ledge with magnificant views down to Lago Molveno some 2000m below us. After the plaque to Gabari Guiseppe, a ladder descent lead to potentially one of the most problematic spots of the whole trip - a snow gully coming down from the summit of Cima Brenta. A loose wire was stretched across the gully giving no support but without ice it was a just matter of skipping as quickly as possible across the snow. The next section of the route was very exposed and lead to the bottom of the long ladder - the "ladder of friends". The top of ladder was soon reached to summit on the fairly flat high level limestone pavement of Spallone De Massodi, the highest point of the day at 2999m and a good spot for lunch. Ladders, intermittant cables and some walking lead onwards to the split in the via ferrata cable and the start of the S. Oliva Detassis. The route down this was a dramatic series of very steep ladders then stemples and wire and once down at the bottom a pleasant short walk lead us to the Rif Alimonta. On arrival at the hut, the warden tried to have no knowledge of our email correspondence and the hut booking and it was only after producing evidence of this did he admit we were booked in. A word of warning - even in September the huts were very full so book before you go where ever possible ! The third day of the trip took us from Bocca dei Armi along ledges on the eastern side of Cima Dei Sflumini, around the amazing spire of Campanile Baso and then to the western side of Cima Brenta Alta with a series of ladders and ledges transporting us through the most dramatic rock formation you could imagine. A glacier crossing was the first hurdle of the day but fortunately the snow was crisp giving a good footing and the route was very clear. A series of four ladders lead to a pleasant clean rock rib with striking views down the glacier to where we had started the day. The rock ledge then started that eventually lead all the way round to Campanile Basso which came into view after about 15 minutes more climbing. The traverse along the ledge towards the Campanile was truly memorable and took a considerable time due to the number photos and video shots taken! After a descent to the col at the bottom of the Campanile a refreshment break allowed some time to watch the rock climbers on the column. 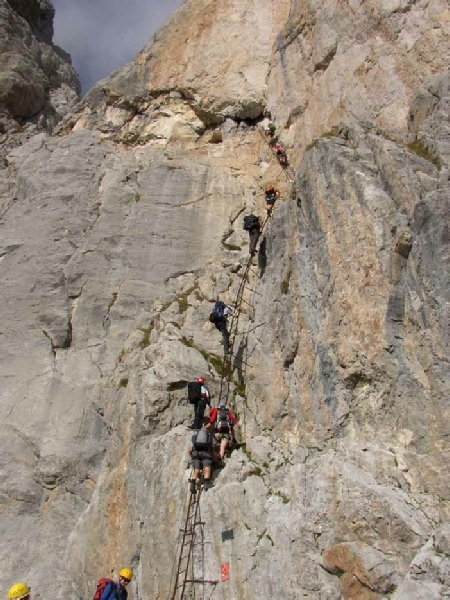 The ledge traverse then continued with the navigation of a bridge and overhanging roof until the final ladder descent to the Bochetta di Brenta and the short walk to Rif Pedrotti. At this stage it was decided to take the 320 path around to the Rif Agostini. The route through the Pozza Tramontana and the Sentiero Palmieri was a very pleasant way to finish the day. 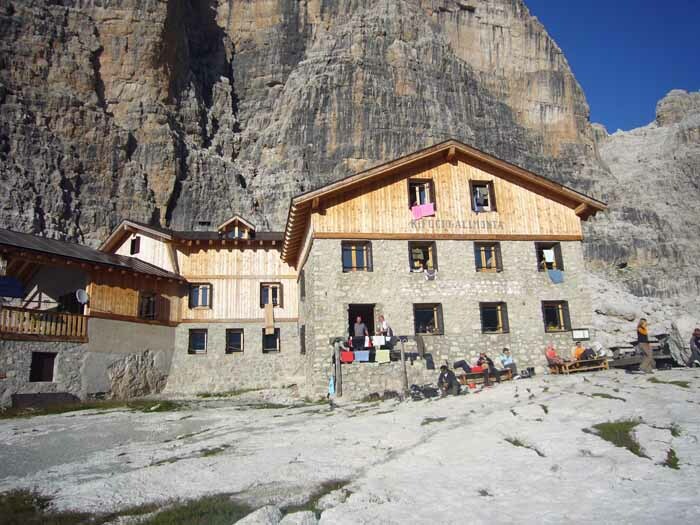 The rifugio made us very welcome and the food was the best of the 3 huts we stayed in. Highly recommended. The day again dawned clear and bright as we made our way upwards to what would be the last via ferrata of our Brenta traverse. A very steep cliff loomed ahead of us with the route up its face picked out by the line of climbers in front of us. 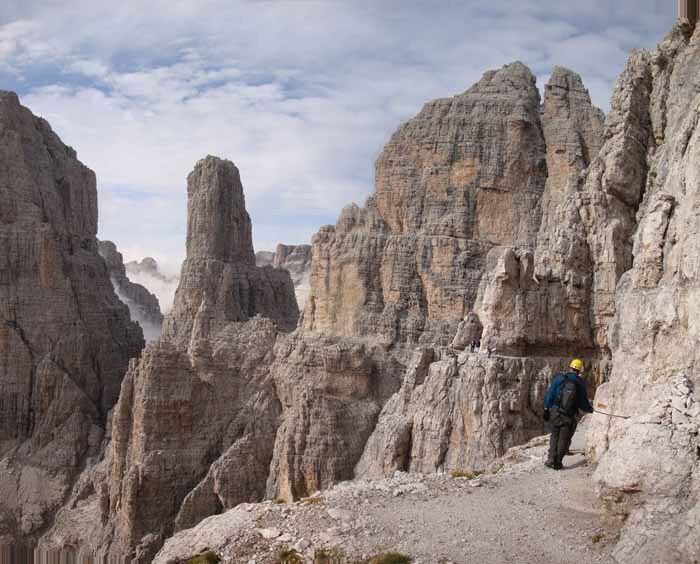 A sequence of 13 ladders took us up the cliff with little trouble and we were soon at the Bochetta de Due Denti. The views were expansive and we could now see our next goal - coffee and cake at the Rif XII Apostoli. The descent to the rifugio was relatively easy and the coffee was excellent. After deciding that the glacier crossing on the route to the R Brentei could be problematic without crampons we started our trek back to Madonna de Campiglio down path 307. The descent was long with some loose scree in places but eventually flattened out into the very pretty Val D'Agola valley. The made up road was reached and the drivers managed to persuade a kindly motorist to take them the last few miles to pick-up the hire cars in Madonna. 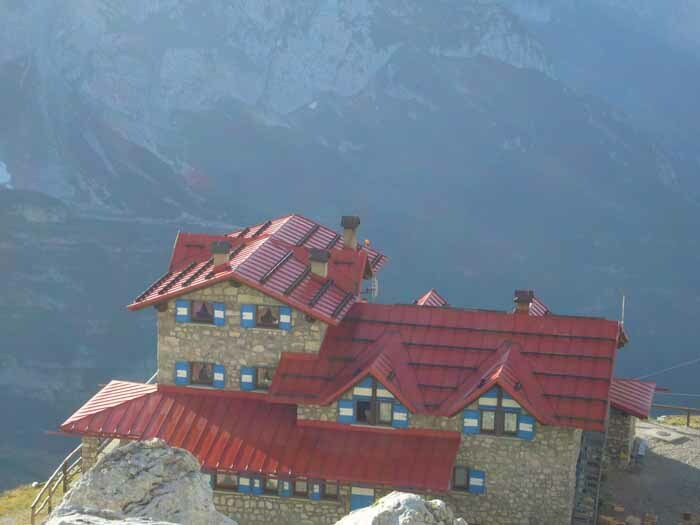 The trip had been a success, the mountains had been kind to us and given us fantastic weather and memories to treasure for the rest of our lives. 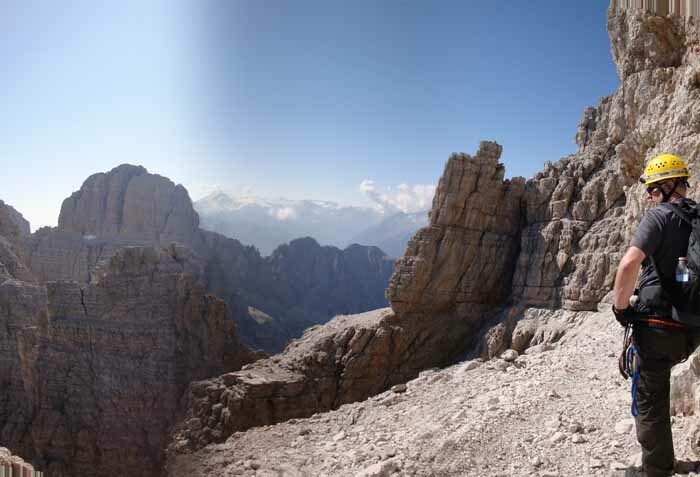 We had enjoyed our Brenta traverse immensely, our chosen route was done and we were happy - very happy.